You may have heard the acronyms CPR and BLS before but didn’t really understand the difference. This guide aims to help you know the difference and get to know which certification would be best for you. If you want to improve your life skills or employment prospects, or simply be prepared for whatever medical emergencies life may throw at you, Cardiopulmonary Resuscitation (CPR) or Basic Life Support (BLS) certifications are worthy pursuits. CPR is an emergency life-saving procedure that is performed on people whose hearts have stopped beating. This technique has been honed over the past century, as medical professionals are constantly updating best practices. By compressing the chest and blowing air into their mouth, the person administering CPR tries to keep the heart beating and keeping oxygen moving throughout the body until emergency medical service professionals arrive to administer more advanced techniques. CPR increases a person’s chances of survival if they are in deep distress. When a certified bystander can administer CPR effectively, it greatly improves odds of that person making it through a medical emergency. Without oxygen it’s only a matter of minutes before the average person can start to experience permanent brain damage. CPR also helps keep the heart in a condition where it’s more likely to respond to defibrillation. In fact, if you witness a cardiac arrest it’s crucial to call 911 and start CPR as soon as you can. The actions that you take are vital, and the sooner you can begin CPR, the more likely it is that you are going to save a person’s life. Cardiac arrest ranks as one of the most common reasons an adult stops breathing and may need CPR. Other life-threatening events where CPR has been notably effective include incidents of drowning and drug overdoses. In cases where someone has tried back slaps or the Heimlich maneuver and those approaches have not helped dislodge an airway blockage, CPR is an appropriate remedy for choking. CPR is the most effective way to deal with frightening and stressful cardiac or respiratory emergencies. It’s one of the easiest procedures you can learn to help save another person’s life. Keeping your CPR training up to date is a crucial way to stay prepared, even if you are not administering the technique too often in your day-to-day life. CPR is also performed on children and infants. However, a different protocol is required. While adults tend to need CPR for cardiac incidents, children and infants need it as a response to respiratory failure or poisoning. Also, because infants’ bodies are more fragile than adults, CPR requires you to use your fingers instead of the palm of your hand to do chest compressions. BLS is a level of medical care administered by public safety professionals, first responders, healthcare providers, paramedics and qualified bystanders. These groups who are trained in BLS give care to someone with a life-threatening illness or injury until that person can get to more advanced care at a hospital. Typically, BLS care is given to people who are in cardiac arrest or respiratory distress or who have an obstructed airway. BLS certification provides high-quality CPR training to allow individuals to effectively deal with adult, child, and infant emergencies. In a BLS certification class, participants experience a deeper coverage of CPR fundamentals as well as a greater depth of basic medical knowledge. This deeper knowledge allows you to understand exactly how to behave in emergency situations. The class is ideal for medical professionals, a BLS certification promotes useful actions that a healthcare provider would need to perform in their professional roles. Resuscitation will require you to use a defibrillator, if it is appropriate to do so. These devices send an electric shock to the heart to restore a person’s regular heartbeat if it stops. Defibrillators also can prevent or correct irregular heartbeats. Be prepared to offer advanced life support, such as cardiac monitoring and post-resuscitation care. People with BLS certification can perform the first three steps, the fourth step must be left to medical professionals. The major difference between a BLS and a CPR qualification is the curriculum of the training programs. Just like any other qualification, a BLS or CPR course has a specific course outline specifying what students will learn from the lectures and materials. BLS certification is generally more intensive and complex than CPR training and encompasses a wider variety of medical training. A CPR course can often be a precursor to a BLS certification course, which is often considered a slightly more advanced option. As a result, many healthcare fields prefer a BLS qualification as a prerequisite certificate because it covers more learning ground. While CPR training is an important qualification for everybody to have, in the sense that there is nobody’s life that wouldn’t be enriched by having CPR certification, a BLS course is more suited for individuals who are considering, or already have, a career in the healthcare industry. That is not to say that people who aren’t considering a career in the healthcare sector wouldn’t benefit from BLS training as well. Some of the treatments and actions that are part of BLS training also would be taught as part of any CPR class. This includes, but is not limited to, helping a person keep an open airway. It also includes ensuring the blood and oxygen keep circulating through the body of an unconscious individual without the need for mechanical assistance. In short, if you enroll in a BLS course, you will learn everything you would need to perform when delivering potentially lifesaving CPR, such as chest compressions. However, the term basic life support (BLS) also can encompass a variety of more in-depth practices that might be required in a hospital setting. For example, you would learn how to administer oxygen, the team approach to CPR and advanced airway management. There are many professions that benefit from CPR certification, such as teachers, football coaches, and daycare workers. While they are not medical professionals, they still have responsibility over children and may have to provide lifesaving in an emergency. For more general safe environments such as an office, CPR and automated external defibrillator, or AED training, is often sufficient. If you’re considered a professional rescuer, healthcare provider or a student in any of these professional fields, you will likely be required to take BLS classes online. If you’re considering a career change and would like to pursue a career in the healthcare industry, then BLS certification is an ideal first step. 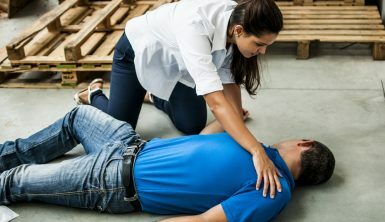 The National CPR Foundation’s free online course will help you learn how to respond to emergency situations by yourself or as part of a team. The techniques that you will learn in this course generally are used by trained professionals, including EMTs and paramedics. If you’re not working in the healthcare industry and don’t require certification, CPR classes online should be just fine for you. As part of the National CPR Foundation’s free online course you will learn how to administer CPR correctly to adults, children, and infants. You will also learn the requirements for safe and effective CPR administration, as well as how to operate an automated external defibrillator. If you’re in pursuing a CPR or BLS certification online we offer free online CPR and BLS classes. Don’t worry, you have as many attempts as needed if you don’t pass right away. The best thing about these courses is that you only pay after you’ve passed the certification exam! BLS covers essential life support skills that should be familiar to anyone. The course includes the skills required for successfully administering adult, child and infant CPR. 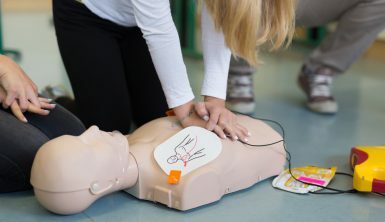 The course also helps you identify risks and ensure the safety of people who need your help.You can expect to cover CPR precautions, initial assessments, recovery position, CPR, compression-only CPR, reducing choking risks, first aid training, wound care, dealing with fractures, burns, and poisoning, and preventing the transmission of blood-borne pathogens. This is ideal for nurses, care workers or medical professionals who need to ensure they have the most up-to-date training. 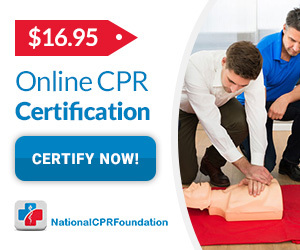 Start your online CPR or BLS certification today! You never know when you’ll need the skills you learn from one of our free online classes. All of our courses follow the guidelines of the American Heart Association (AHA) and the Occupational Safety and Health Administration (OSHA).